While these instructions are helpful, they cannot replace woodworking expertise. 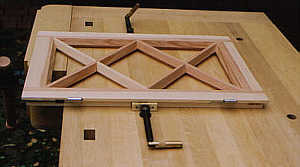 We recommend that only experienced woodworkers try installing tailvise hardware. 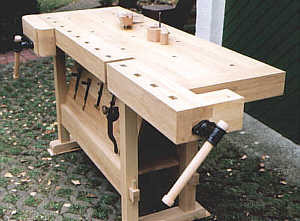 This is the bench in which the tailvise was installed. The pictures and drawing are courtesy of Rene B., who not only built the workbench, but also took the extra effort to photographically document its construction. Our thanks to Rene B.! Overall view of tailvise assembly. 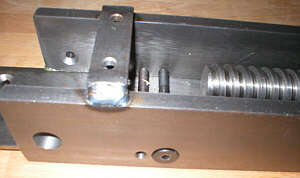 The assembly consists of a base plate, vise body, benchscrew with mounting flange, and T-piece for attaching the handle. Attaching base plate to bench. Attaching tail vise to base plate. Note the two screws visible near the right end of the tail vise body. 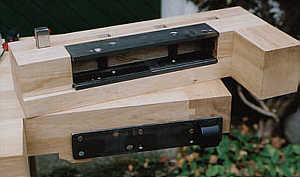 In the overall view of the tailvise, an identical pair of screws is visible near the left end of the vise. 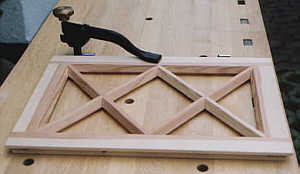 To separate the body of the tailvise from the base plate, the left-hand pair of screws must be removed with an Allen (hex) wrench. One screw of each pair serves to adjust the gap between base plate and vise body, so that movement of the vise body relative to the base plate can be made as tight or as loose as desired. The second screw (at right in the picture) sets drag (resistance) at the desired level, and must first be loosened to permit adjustment. After the tailvise body is mounted on the base plate, mount the wooden vise body on the hardware from the front, slide the vise to its greatest opening and attach the wooden vise body permanently to the hardware from the rear and below. Do not install the left-hand pair of Allen screws at this point! Tailvise is shown from below for clarity. In the picture, tailvise is only temporarily placed - the wooden vise body will be permanently attached only after the tailvise body is mounted on the base plate. Important: screw holes are only accessible when vise is at its greatest opening! 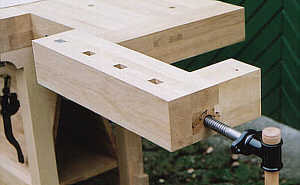 Insert bench screw in wooden vise body and attach with two woodscrews. Close vise and attach the left-hand pair of Allen screws. You can now set drag. The 19 mm (3/4 inch) dogholes will also accept Veritas bench dogs, resolving most holding problems. You are here: Homepage → Workshop Equipment → Front Vises, Tail Vises, Screw Spindles → Workbench build by René B.